This article is about the species. For the Whale from Paper Mario, see Whale (character). A whale is a large aquatic mammal. Their first appearance in the Mario franchise is Super Mario Bros. 2. 1.5 WarioWare, Inc.: Mega Microgame$! 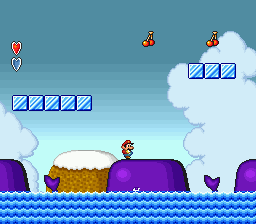 Whales appeared in World 4-2 of Super Mario Bros. 2. Players can hop on their backs and gain elevation by standing on their blow holes as water sprays out. The water will hurt the player if they touch it from either side but a Super Star can be used to destroy the spout. Pink (blue in remakes) Snifits and Shyguys patrol the backs of some whales. There is also one whale which has grass growing on its back. In the NES version, they are black with red eyelids, but in the SNES version and other subsequent remakes, they are purple. In Super Mario Land 2: 6 Golden Coins, Mario has to go inside a whale and travel through it in order to reach and defeat the Octopus and obtain one of the Golden Coins. A whale from The Super Mario Bros. Super Show! 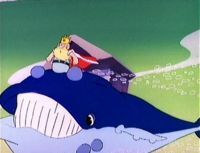 A whale briefly appears towards the end of The Super Mario Bros. Super Show! episode "Mario of the Deep". Here, King Neptune rides on the whale, and uses it to body slam his temple, which Barra-Koopa has taken over, along with the rest of Aqua Land. After slamming into the wall several times, the whale causes a piece of it to shatter away, which Mario, Luigi, Princess Toadstool and Toad are able to pass through. This whale appears to be a blue whale rather than the variety of whale from Super Mario Bros. 2. 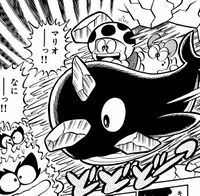 A whale has made an appearance in volume 8 of Super Mario-Kun. Toad and Birdo ride on a whale that crashes through the sky literally. It flattens the Fryguy that is fighting Mario, Luigi, and Yoshi. The whale then takes Mario, Luigi, and Yoshi to a castle in the sky. An individual whale appears as a character in Paper Mario, where he aids Mario and his allies by getting them across the sea to Lavalava Island. The whales from Super Mario Bros. 2 also appear in WarioWare, Inc.: Mega Microgame$! in the microgame Blow Hole Bridge. One of the multiple whales appearing in the optional level, Blowhole Bound, in Donkey Kong Country Returns. In Donkey Kong Country Returns and Donkey Kong Country Returns 3D, whales appear in the level Poppin' Planks, where a whale jumps out of the water when a switch is activated and sends bananas out of its blowhole that disappear after an amount of time. Whales also appear in the level Blowhole Bound, where the player(s) can ride on the whales. After freeing a whale from an anchor, the player(s) can ride on its back to cross the water along the shore of the islands. The whales are not very steady and often tilt along the water, allowing the player(s) to grab some collectibles hidden high in the air. The whales sometimes head underwater as well, where the player(s) cannot swim, so the player(s) have to jump on floating ship parts to progress. These ship parts are often destroyed by the whales. By hand-slapping the whales' blowhole, the player(s) can force the whale to send water out that they can use to reach pickups in higher areas. The whales in the game look similar to a sperm whale. Whales, possibly of the same species as those that have appeared in the previous game, also live in Sea Breeze Cove from Donkey Kong Country: Tropical Freeze. This is evidenced by their silhouetted presence in the background of Amiss Abyss. However, they do not interact with the Kongs anyhow. This page was last edited on March 23, 2019, at 10:31.